Chris graduated from Westminster College with a bachelor’s degree in Business with a concentration in Finance. 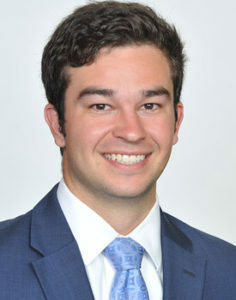 During his time in school, he was a member of Kappa Alpha Order and was part of the Blue Blazers Investment Committee as well as Student Foundation. Chris continued his education with a FINRA Series 7 and 66 licenses, as well as life and health insurance licenses. As an associate at AXIUS Financial, Chris plans to thrive and grow within the financial services arena. Since he joined the AXIUS team in 2015, Chris has worked with clients to help plan for college and retirement. Chris enjoys volunteering at KEEN St. Louis (Kids Enjoy Exercise Now) and working to empower youth with disabilities by providing free, non-competitive one-to-one programs of exercise, fitness and fun. Chris is a basketball coach with KEEN and loves seeing the children build confidence and self-esteem as they grow in the program. He is an Executive Board Member and a Young Professionals Board Member. When not busy working or volunteering, Chris enjoys golfing and spending time with family and friends.